With everyone being home and in desperate need of a date night, Dani and I wheedled my father in law into babysitting, so we could get out and have a little one on one time. 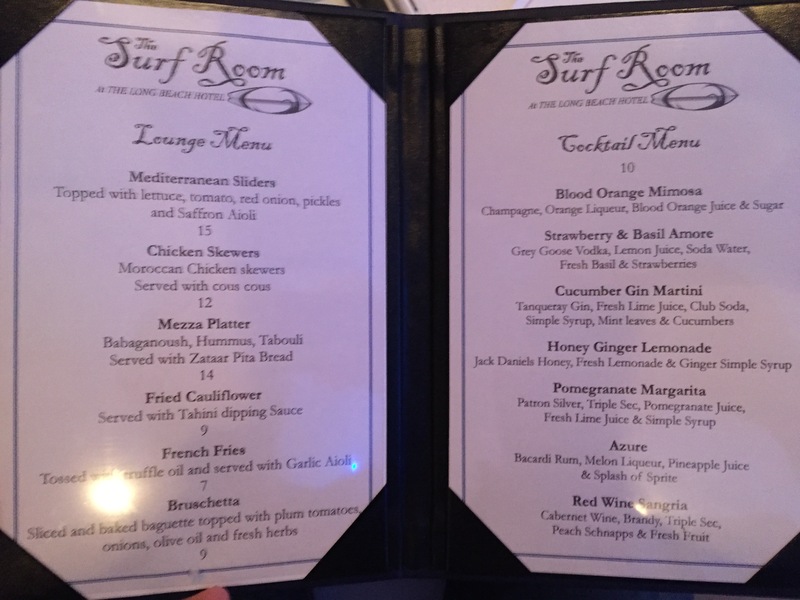 We decided to try out The Surf Room, a new restaurant that opened in the recently sold and revamped Long Beach Hotel, and boy did we get alone time. The hotel does not get the best reviews [Trip Advisor reviews], and it was easy to see why. From the outside it looks like an old tenement apartment building and lacks all the glamour and charm of a beachside hotel. Inside, the hotel has been renovated and is pleasant. 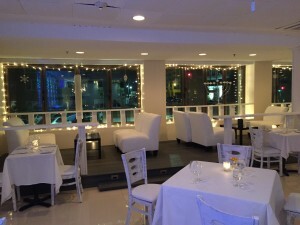 The restaurant located in the hotel, is in the rear of the lobby, make a left as you walk in. The Bar & Grill on the right by the entrance is not kosher. The decor of the restaurant is OK, nice lounge areas with large windows that face the ocean, a cool textured wall, and distressed “sea bleached” chairs, give it a beachy, lounge like feel. 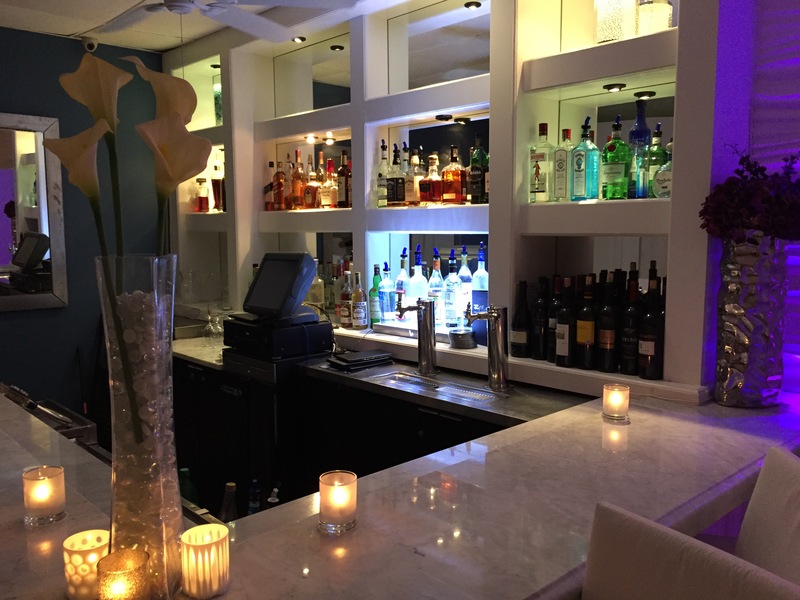 There’s a full bar and a separate lounge/bar menu for those who don’t want a full sit down dinner. When we arrived we were the only ones in the whole restaurant (!) that looked as if it could seat around 100 people. We weren’t sure what to expect being the only ones in the restaurant and since it was just the two of us, we decided to get two entrees and two sides. 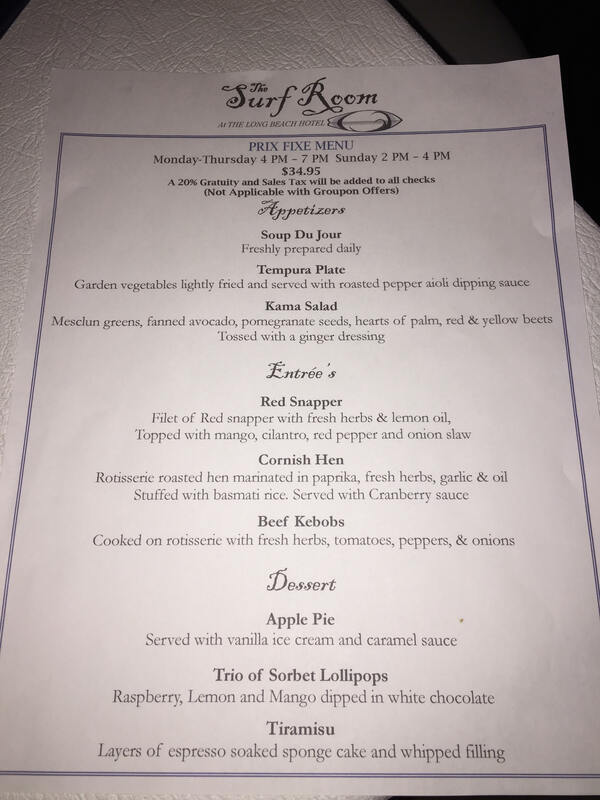 The menu is set up so that everything is a la carte. The entreés do not come with any side dishes and are somewhat pricey. 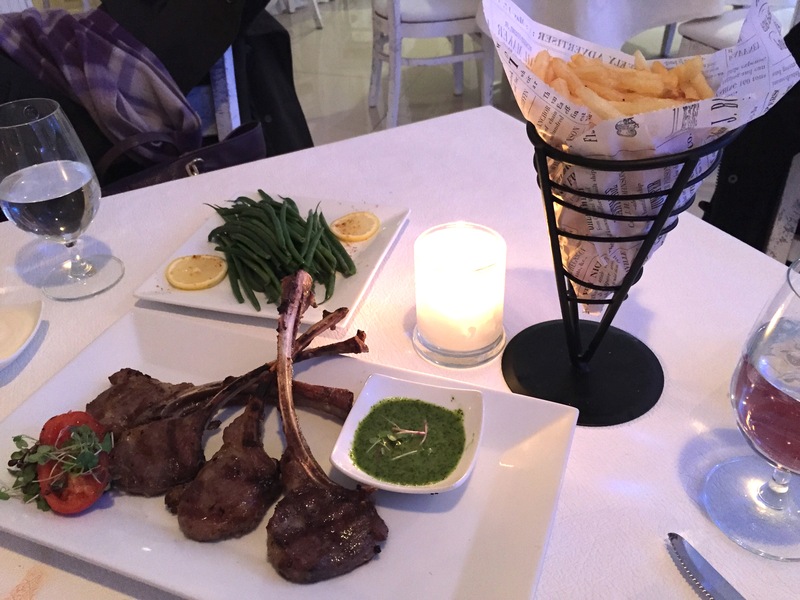 We chose the whole branzino, roasted in lemon, garlic and white wine, with a side of haricot vert that were tossed with olive oil, lemon, garlic and sumac, as well as the Lamb Chops served with mint chimichurri dipping sauce and a side order of Truffle fries. 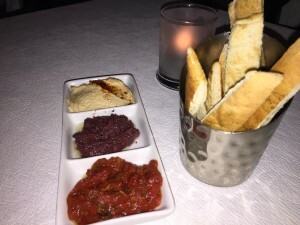 After we ordered the waiter brought us a mezze of middle eastern dips: hummus, olive dip, and matbucha, with crisp pita strips, some with olive oil and za’atar on top. We were pleasantly surprised by how good this was. We asked that the bronzino be deboned for us. We each received a plate with half the fish, and some pretty, artistically carved, lemon wedges. The fish was delicious. Melt in your mouth, with delicate hints of lemon, garlic, and chardonnay. Light and fresh, it hit the spot. 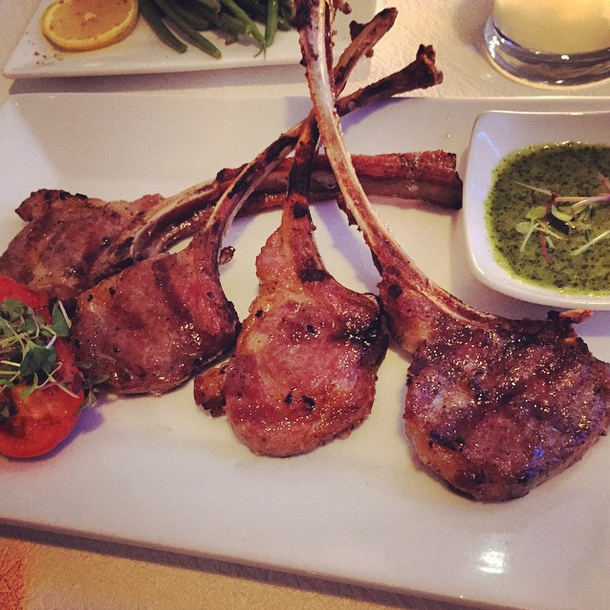 The lamb chops were brought next, it comes 4 to a plate with a dish of the dipping sauce. The lamb was incredibly juicy, cooked to a perfect medium rare, and the mint chimichurri really heightened that incredible grilled lamb flavor. Needless to say, I’m still drooling over those babies. The haricot vert were nicely seasoned, and still had a nice crunch to them: they weren’t mushy and overcooked as in many other places. I only had a few truffle fries, but they were nice and crispy on the outside, with the savory and delightful hit of the truffle oil. Dani seemed to enjoy the flavor of the fries but was disappointed that the fries seemed to be out of a frozen bag and not fresh, especially considering the price. 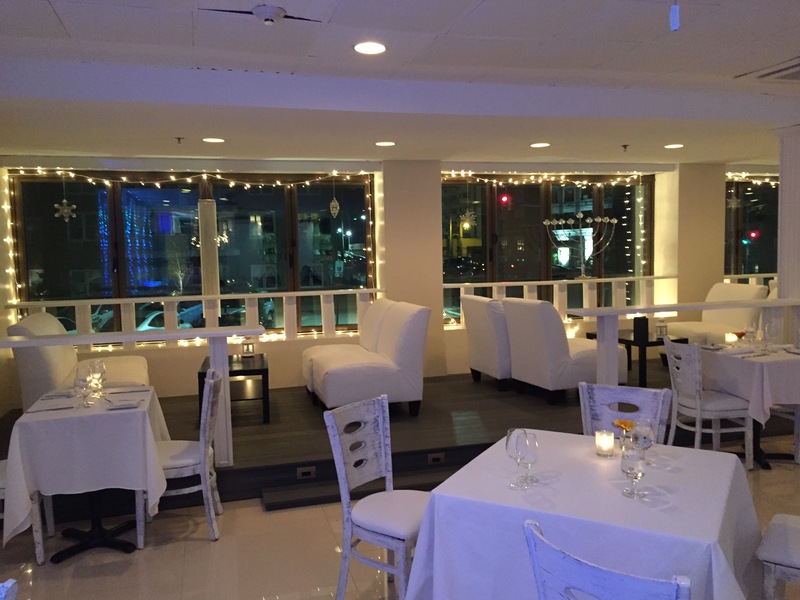 Overall, we were both very impressed with the quality of the food, as well as the presentation. 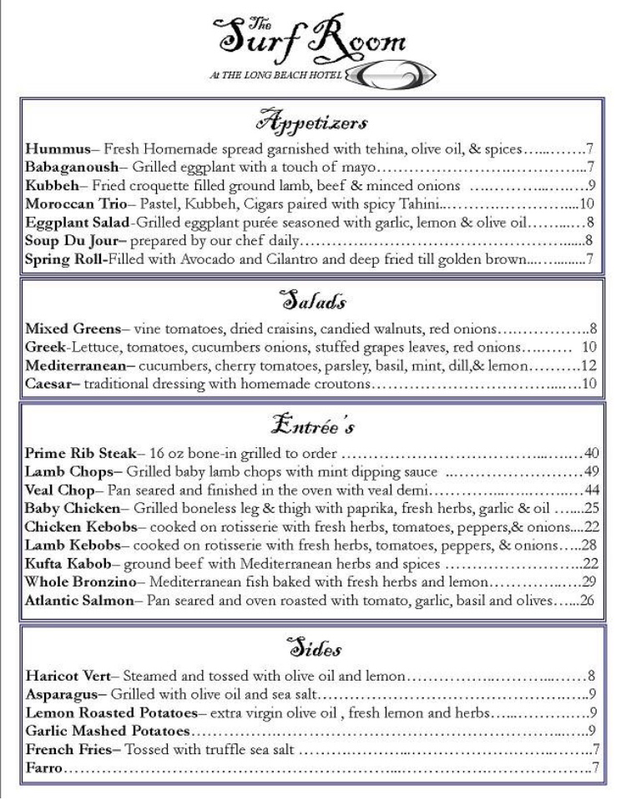 I wouldn’t hesitate to go back and try more items on the menu. I definitely recommend this a nice date place or a fun place to hit with friends. Check it out, I think like me, you’ll be pleasantly surprised.